Buckle up! This is gonna be a pretty long rant today about Poligion. What is "Poligion," you ask? I'm sure I'm not the first person to coin the term, but I've been using it for several years now and I think it beautifully describes all that's wrong with our government institutions and political discourse these days as well as those who make a career out of both. In other words, "Poligion" is the unholy marriage between Politics and Religion in the United States today. Plus, whenever Poligion is usurped by a politician (and definitely by a President), then it becomes an unholy trinity of Politics, Religion, and Idol Worship. Yes, history confirms what the Bible teaches us when it clearly says that "pride goeth before a fall" (Psalm 127:1). I'll admit, one of the things I need to spend much more time reading about and studying is the "Doctrine of the Two Kingdoms" particularly as we quickly approach the U.S. Presidential Election in November. I'm sorry to say that it's one doctrine that I've completely neglected to the point where I really haven't looked into it at all since becoming a Confessional Lutheran for whatever reason. Still, as a former American Evangelical, I recognize how extremely important it is for us to properly understand the role of both Church and State as the Lord intended such institutions to be. I guess I just prefer to read through Daniel, Hosea, Ecclesiastes, and Acts first before turning my attention to what our Confessions have to say about the subject. All in due time, God willing, of course. I mention all of this since I recently discovered some things while going back through my old writings that are now 4-8 years old. No, this isn't a "Political Blog" per se, even though I might write about political topics from time-to-time, but I'm wondering if I should perhaps take some time each week from now until the election to focus on politics. Up until now, I only wrote a couple of distinctly political pieces -- the first was my Lutheran response to Billy Graham's "My Hope America" and the second was about how Donald Trump let the wolves place their paws on him. It's true that I haven't said much on social media, but I've been feeling quite disenfranchised lately. As a registered Republican my whole life, I'm disgusted by what I'm witnessing in my beloved country. As a man of faith and principle, I'm having a hard time keeping my mouth shut when it comes to political discussions with family and friends. While my faith has changed dramatically since the last Presidential Election in 2012 (having been an American Evangelical who was a Non-Denominational-Spiritual-Island-Unto-Himself-Who-Believed-Hook-Line-And-Sinker-All-The-End-Times-Left-Behind-Nonsense type of Christian and having become a Confessional Lutheran), what hasn't changed is my voting record. My entire life I've always voted for the Republican candidate no matter what. Sure, I held my nose when John McCain ran, but I still voted for him. However, back in 2012, that was the first time in my life that I didn't vote for anyone and I considered my "non-vote" a form of formal protest. I vowed to register as an Independent, but here we are 4 years later and it still says "R" next to my name. Only one small problem though: I cannot in good conscience (at least not at this specific moment in time as I write this) vote for Donald Trump let alone any candidate put forward by the Republican Party in light of all the hypocrisy I've witnessed from them not just from the past several months, but especially from the past couple of days. I realize that now that I've let that cat out of the bag it could put a serious strain on a relationship or two, but I just can't remain silent on the sidelines anymore. It's as is Common Sense no longer exists in this nation. For me, Donald Trump is the Republican version of Barack Obama in 2008. I'd be a hypocrite if I didn't criticize him and the Republican Party for the very same things I criticized Barack Obama and the Democratic Party back in the run up to November 2008. Surprisingly, a good number of my family and friends who are Trump supporters don't see that (or they do, but just don't care). Furthermore, while I recognize your right to vote any which way you want, and don't criticize you to your face about it, please extend the same level of courtesy to #NeverTrump - ers like me who are also exercising that same right whether we choose to vote 3rd Party, vote a Write-In, or stay home. How did I, a Conservative Christian and lifelong Republican get here? Well, when the Republican Party treats constituents like me as though our voice doesn't matter, when they blatantly ignore or violate the rules of the Convention two cycles in a row now, and when they criticize one candidate for something their candidate supports, then they must think we're all stupid or, even worse, they just don't care what we think and are gonna do things the way they want, then that's precisely the moment when I start to view them as being no better than the Democrats who I would fully expect to act that way. Now, I'm not naive. It's not like this just happened overnight and I'm suddenly noticing it for the first time. No, not at all, but my patience has certainly worn thin. As a young Christian husband and a father, I'm also angry and concerned by what I'm seeing on a daily basis. So, naturally, I did what I've always done. I turned to reading God's Word and then prayed about things. However, I did something else that I never did before. I went back through all my files to search for the things I wrote back in both 2008 and then 2012 when I had my other blog, and when I believed that things were even more hopeless than they are today (remember, back then I believed that the "final 7 years of human history on earth" made up of both the "Tribulation" and "Great Tribulation" were "prophesied" in the Bible and that such election results were sure to usher in a "fulfillment of end times Bible prophecy"). What I discovered surprised me. Yet, strangely enough, it also comforted me and made me think of what God already tells us to expect in this life. So is this just a case of "Politics As Usual" then and I should just grin and bear it? Yes and no. With that in mind, let's look back at what I wrote on Election Day 2012 some 4 years ago now (please allow me to insert a more current picture to accompany that piece though). I’m just going to warn you from the start. This is not going to be an easy blog post to read, because it certainly wasn’t an easy blog post for me to write (and apply to myself). To vote, or not to vote? That is the question today. Now, I know that in this day and age, it’s considered 'blasphemous,' 'sacrilege,' and downright 'unpatriotic' to even suggest any alternative other than total participation in the democratic process of electing our government oﬃcials. Forgive me, but I must at least suggestive an alternative, and for very good reason, I might add. You’ve all heard the cliches I’m sure. 'Just hold your nose with one hand and pick a candidate with the other...' and 'Just pick 'The Lesser of Two Evils' and be done with it...' My dear brothers and sisters, I want to humbly ask a diﬃcult question: Is it ever ok for any self-professing Christian to really feel good about admitting to others that they voluntarily chose 'The Lesser of Two Evils' given all that God’s Word has to say about hating evil? Proverbs 8:13 (KJV)The fear of the LORD is to hate evil: pride, and arrogancy, and the evil way, and the froward mouth, do I hate. Amos 5:15 (KJV) Hate the evil, and love the good, and establish judgment in the gate: it may be that the LORD God of hosts will be gracious unto the remnant of Joseph. Psalm 97:10 (KJV) Ye that love the LORD, hate evil: he preserveth the souls of his saints; he delivereth them out of the hand of the wicked. Romans 12:9 (KJV)Let love be without dissimulation. Abhor that which is evil; cleave to that which is good. Psalm 45:7 (KJV) Thou lovest righteousness, and hatest wickedness: therefore God,thy God, hath anointed thee with the oil of gladness above thy fellows. Isaiah 5:20 (KJV) Woe unto them that call evil good, and good evil; that put darkness for light, and light for darkness; that put bitter for sweet, and sweet for bitter! I think we can all agree that, in these selected verses, God says what He means and means what He says. Voting for the 'Lesser of Two Evils' is still voting for evil, isn’t it? You bet it is. How does that encourage any future political candidates to change if they know that we’ll still vote for them anyway regardless of their positions on the issues that matter most to us? Sorry, I’m getting ahead of myself. I’ve been debating (praying) as to whether or not I should write and publish a political piece here today. The reason for my hesitation is that I want to be very careful not to give the impression that I have a certain view of Christians who vote today as well as a certain view of those who don’t. Instead, rather than disparage my family and friends, and any of you, I merely want to encourage everyone to prayerfully consider some things that have been on my mind pertaining to our national election. You may agree or disagree, but I will not apologize for making the case, because I’m only trying to help the 'lukewarm' become either 'hot' or 'cold' in this late and urgent hour (Revelation 3:16). Plus, I thought it might be helpful to try and organize my many thoughts on this topic as a transparent gesture to all of you who have been a part of this Christian community for so long. After all, Look Up Fellowship was born out of a response to what I saw happening in the political realm way back in late 2008 (just before the Election), and so, it seems only appropriate to publish a political piece here today for your prayerful consideration, especially given where we are on God’s prophetic timeline. Bottom line, I can completely understand if some Christians view not voting today as a vote in-and-of-itself (as a sort of 'protest' or a 'vote of no conﬁdence'), and I can completely understand if some Christians will head to the polls and view voting today as their rare chance to vote their cherished Christian values. I truly get both sides of the issue. I sincerely do. I believe the Scriptures are quite clear that any action we take must be done to the glory of God (1 Corinthians 10:31; Colossians 3:17; Colossians 3:23), and must be in accordance with our God-given conscience (Acts 24:16). Those two key pieces of the puzzle are symbiotic, and not mutually exclusive. Furthermore, the Word of God is also clear that when it comes to governments and political authorities, they are all ordained by God (Daniel 2:21; Titus 3:1; John 19:10-11). In fact, an oppressive government can actually be a form of His righteous judgment upon a rebellious and unrepentant people. Our submission to -- yes, submission to -- the government and political authorities is the Biblical mandate that each and every one of us is expected to follow. While we are not to submit to them to the point of disobeying God, we can certainly study the life of someone like Daniel as just one prime example to help us learn the proper Christian response in the face of such an immoral and tyrannical government as the one we’re under today. Thus, it’s been said that our voting for a certain kind of government, or a certain kind of politician, is rather meaningless from a Christian perspective when you consider these crystal clear Biblical truths. Yet, it is within our fallen, ﬂeshly lusts to want to have some kind of control and power in this life. We want our voices to be heard by other people, we want to make a diﬀerence, but aren’t we supposed to be praying to the Lord to help us with such things? Aren’t we supposed to be praying for our political leaders -- including those who we dislike? Yes and yes. If we’re not careful, then the commands to do the right thing in this life can themselves become an idol, particularly should we ever lose sight of the sovereignty of God in all things (Romans 8:28). I’ve heard some Christians I greatly respect point out that if you are going to vote, then you must recognize that it’s a question of Romans 13 and not a question of John 3:16. In other words, we need to vote for the individual(s) that we believe will best uphold Romans 13 (even if they don’t consciously or publicly acknowledge its existence as a guiding set of principles in their life). I think that’s a solid point. Most importantly, we need to understand that an election is a static event for us believers within the Body of Christ. Simply put, our primary concern of preaching the Gospel of Jesus Christ to a world that desperately needs to hear it does not change depending on who wins an election. I’m sure that there are some who are reading this who will suggest that certain political parties, politicians, and the resulting government that they establish could become a hindrance to our ability to preach the Gospel. My dear friends, ﬁrst of all, we cannot do anything apart from the Lord! It is He who saves (John 6:44; Ephesians 2:8-9), and we merely get the privilege of being a part of the process, but it’s not us men and women who actually save someone’s soul. What I mean is that even if a law were made to prohibit preaching the Gospel, the Lord could still save whomever He wishes to save in ways we probably couldn’t even imagine. So, in one sense, if we were all rounded up and put into FEMA Camps tomorrow as part of some national crackdown on freedom of speech, guess what? Our mandate would still be the same. We would still be expected to bring glory, honor, and praise to our Lord and Savior Jesus Christ by preaching the Gospel to those we were sharing a cell with, and to those who were persecuting us and putting us in those cells. You do sincerely believe that, right? If not, then please go back and read through your Bible again, especially the Book of Acts. Prayerfully consider the biographies and testimonies of Christian martyrs from around the world too. Hopefully,this brief introduction has helped to put everything into perspective regardless of what happens in this country today, tomorrow, and in the days, weeks, and months ahead politically speaking. Please don’t misunderstand me. Those warnings we wrote about the possibility (and then the reality) of a President Barack Obama and what it could mean prophetically speaking were spot on, but, far too often, our love for the Constitution and this country ﬂirted with trumping our love for the Lord and His Word. Thankfully, He straightened us out and matured us pretty quickly. Now, we still shine the light of truth on the darkness of deceit (Ephesians 5:11; Ephesians 6:12), but we do so with an unshakable conﬁdence in God and His sovereign plan for all of humanity regardless of who ends up running this nation. So, here we are, 4 years later, and faced with the prospect of another 4 years of 'Obamanation' in this country. Yet, all I can keep thinking about is how the Body of Christ could very well be deceived by the other front-runner. I mean, the Bible that I’ve been reading and studying these past 4 years tells me plainly that things are only going to get worse, not better. But millions of Christians strongly believe that this is their one chance to elect a man who can help God’s 'elect' right this sinking ship that we call America. More disturbingly, they seem to believe that one political party is more 'God’s Party' than the other. This is what caused us to come up with the term 'Poligion' and to write about it extensively in recent years (see the LUF Archive). These are just a few of the facts to help put things into their proper perspective, and just a few of the facts that should help us maintain a 'big picture' mentality, or an eternal and spiritual view of things as opposed to merely an earthly and physical one. I hope that you will prayerfully consider all of that whether you voted today or not. Also,this is not meant to be an endorsement for Ron Paul, or anyone else fort hat matter. This is simply meant to prove a point. The so-called 'Lesser of Two Evils' is still EVIL no matter which way you look at it. That’s why this is meant as a defense of the truth, because principles, or doing what’s right, does still matter. My dear friends, I’m not saying that we should become apathetic and just completely check-out when it comes to doing whatever-we-can-whenever-we-can to promote Christian values and do good in this nation. What I am saying is that we can’t just ignore the truth. Besides, it is Jesus Christ who works through us. We serve Him. It’s not the other way around as if somehow we think that if we can just get 'our guy' into political oﬃce, then God will be obligated to do all the things we want done in this nation. Still, as many of you know, and despite what God’s Word clearly tells us about the Christian response to earthly government and politics, and despite all the evidence I just shared above, I’ve been struggling with whether or not I should personally vote for Mitt Romney in today’s US Presidential Election. I’ve listened to (and read) some very good, very strong arguments on both sides of the debate from my dear brothers and sisters in Christ, but just kept wrestling with my conscience on this one. For the longest time, my view was boiled down to this...'If I have to choose between two imperfect choices, then I’m going to choose the one who doesn’t kill babies.' However, Romney is not anti-abortion and is not anti-homosexuality even. Sure, he’s deﬁnitely not as militaristic about his pro-choice and pro-homosexual exceptions, but we can’t really call him 'pro-life' or even 'conservative' in light of these truths. We just can’t. For me, the argument isn’t that Mitt Romney believes in saving most babies. No,the argument is that Romney believes in murdering some babies. I cannot in good conscience or faith accept that. I’ll admit that the obvious response is a good one. 'Come on, Jeﬀ! Obama’s not a Christian, he’s a Liberal Humanist, and millions of people didn’t discard their faith to become a Liberal Humanist, did they? He didn’t start an anti-religious movement in this country, did he?' I don’t know the answer to that question. Do you? My point, is that even if just one soul is deceived, then that’s more than enough. If one soul goes to Hell because of how a 'US President Mitt Romney' could conceivably give validation to that cult, and if my vote could potentially contribute to such a validation, then I cannot in good conscience vote for him. But it goes so much deeper than that though. I mean, just take a quick look at some of the sentiments shared in the LIVE Chat Box to the right of this page from earlier this morning, because they totally resonate with me, especially after the experience I’ve had with a close friend and his family and Eugene Peterson’s The Message. It’s essentially the same issue. 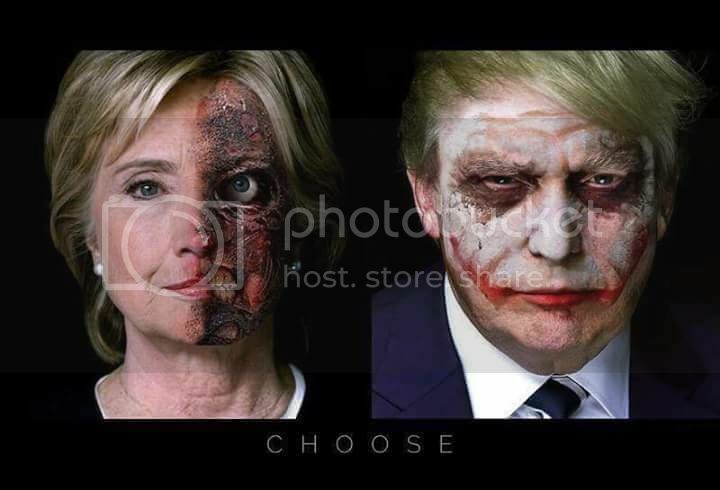 Can I really vote for 'The Lesser of Two Evils' in today’s election? Well, what does God’s Word tell me about 'evil' that I can perhaps use as my guide here in this case? Go back to those Bible verses from the beginning of this piece. Here’s just one of them...Isaiah 5:20 (KJV) Woe unto them that call evil good, and good evil; that put darkness for light, and light for darkness; that put bitter for sweet, and sweet for bitter! For me, that’s more than enough. I pray that today’s entry was helpful. I pray that we remember that we are Christians ﬁrst and American Citizens second. Preach the Gospel of Jesus Christ -- not the 'Gospel of Poligion' as has become too commonplace these days. Make sure people know you are a Christian before they know you are a Democrat/Republican/Independent. Praise the Lord that He is sovereign -- not man. Praise the Lord that it is His Son who saves -- not a political party or its leaders. Contend. Defend. Keep looking up (Luke 21:28)! Sorry, I know that was a really long post all on its own, and that it makes this original commentary even that much longer, but I just couldn't resist sharing it in light of current events. While I've changed a lot since then, I have to say that a majority of what I wrote still resonates with me today and applies to my current mindset regarding the upcoming Election. Now, if you're anything like me, and you agree with merely some of the things I've referenced or written here today, then you probably also found the Republican National Convention's "Benediction" the other night quite disturbing too. Thankfully, Lutheran Rev. Hans Fiene critiqued it for us from a Biblical perspective and offered much godly wisdom. AUDIO: Rev. Hans Fiene Discussing RNC Benediction On Issues, Etc. This was nothing but "Poligion" front-and-center and I'm so glad that another Pastor called Pastor Burns out on it. See, in my humble opinion, the "Christian Poligionists" like Pastor Burns will always ask us believers to "Just Vote For The Lesser of Two Evils" without realizing that we the sheep might actually have a point in being genuinely concerned when it comes to being asked to choose to be led by wolves in sheep's clothing. Again, what they fail to realize is that no political ideology, no political party, and certainly no politician (no matter how popular he/she is!) will ever "save" anyone in this nation, and those who are counting on such to be the answer to their prayers are praying to the wrong god let alone a god fashioned by their own preferences. In a Lutheran layman's terms, Pastors need to preach the Gospel of Jesus Christ -- not the "Gospel of Poligion" or the "Gospel of The Lesser of Two Evils" to sinners in this country.